We were far from idle during our four-day stay in St. Peter Port. We toured Victor Hugo's Hauteville House, visited the Guernsey Museum and Art Gallery, took in the Tapestry Museum, and strolled through the gorgeous Candie Gardens. The photo above shows the back of Victor Hugo's home where he lived, wrote and renovated the interior during his fifteen-year exile from France. The front of the property (below) blends in with the other homes on the street and gives little clue as to its impressive size. A covered lane way to the left of the front entrance leads into the back garden. It's worth noting visitors to Hauteville House must sign up in advance for a guided tour. We arrived at 11:20 and the next available tour in English was scheduled for 13:30. Having two hours to kill we decided to stroll through the gardens as a guide is not required. The interior of the house was decorated and renovated by Hugo himself. He toured the island in search of furniture and those pieces he selected were often masterpieces in their own right. The ground floor contains a sitting room, kitchen, pantry and dining room. With ornately carved, dark woodwork and heavy tapestries hung on walls and ceilings it felt more cave-like than inviting or comfy cozy. This tiled fireplace in the dining room is also one of Hugo's creations. Notice the large H above the mantel. One floor up is a large room that contains both his writing desk and bed. Tapestries hang from the ceiling, dark richly carved hutches and cabinets stretch from wall to wall. Rumour has it Hugo slept in this bedroom just one night and suffered such horrid nightmares he refused to do it again. This inspired him to decorate this rather unique and small, single bedroom on the third floor of the house. The walls are lined with fabric and the dresser handpainted in a style reminiscent of folk art. At the very top of the house is the lightest and airiest room - his study. Here, while standing and gazing east toward France he began, completed or published the majority of the works for which he is best know, including Les Miserables (1862). Returning to the centre of town we walked down narrow streets barely wide enough to allow two vehicles to pass. The Guernsey Museum and Art Gallery is a few blocks from Hauteville House and adjacent to Candie Gardens. This is the cafe that overlooks the harbour. Our primary reason for visiting the Museum was to gain an appreciation for Guernsey's history, but sadly it was closed for renovations. The art gallery, however, was worth a look see. 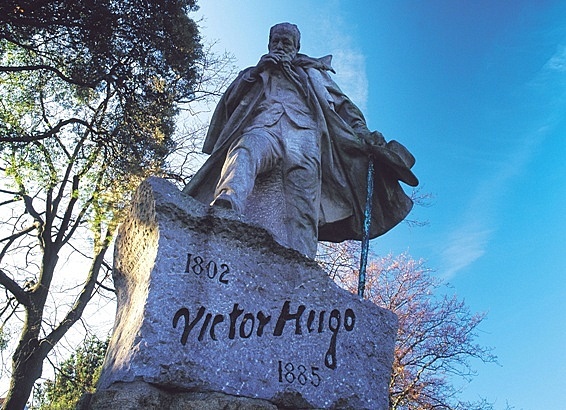 The bronze bust of Victor Hugo is by Rodin. Rodin wrote a letter to Hugo, almost begging to be the sculptor to immortalize him in bronze. Hugo replied 'come if you will, but I will not pose for you.' Imagine the artistic frenzy as Rodin sketch furiously and chased after Hugo while he wrote or wandered about inside his home! Talk about a battle of wills. All things considered Rodin created a masterpiece in this lifelike bust of the French writer. This impressive statue of Queen Victoria stands watch over Candie Gardens and her Highness has a picture perfect view of the harbour and St. Peter Port. At least she did until Victor Hugo arrived. When his statue was erected in the park a great many islanders were not amused. It seemed scandalous that Queen Victoria should have to gaze for all eternity at Victor Hugo's backside - and dare we mention a French backside at that?! Nonetheless, I think Victor ended up with the best view of St. Peter Port. Poor Victoria must gaze over the rooftop of the Guernsey Museum and Candie Auditorium. Speaking of the Candie Auditorium, the Beatles played here in 1963. Tickets cost between 10 and 17 shillings - what a bargain! 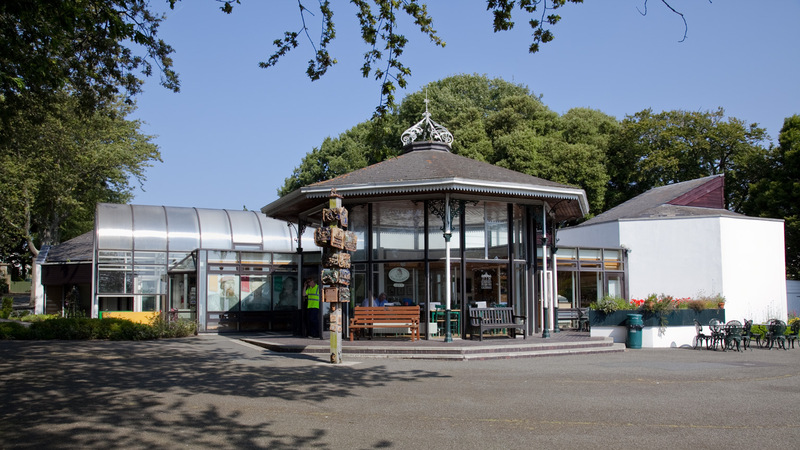 In Part II of From Queens to Poets and Tapestry Makers we'll stroll through the beautiful Candie Gardens and gain an insight into Guernsey's history via the Tapestry Museum.